VEKA is the world's largest extruder of vinyl lineals for the window and door industry, and is dedicated to developing quality outdoor building products. Our reputation of providing a superior product along with unmatched customer service will ensure that VEKA is the right choice for decking, vinyl fence and railing! VEKA employs more than 3,000 skilled personnel and serves customers worldwide with representation in over 30 countries. VEKA has been a leader in helping fabricators deploy technologically advanced materials for residential and commercial building applications since 1983. In 1987, VEKA constructed the industry's first highly automated computer-controlled compounding and extrusion complex dedicated solely to the window and door market in Fombell, Pennsylvania, located 30 miles north of Pittsburgh. In 1988, VEKA made a commitment to install its own tool and die-manufacturing department within the company. Our aim was to improve quality and better control processes. This 21,000 square foot facility holds wire E.D.M. technology, C.N.C milling, and robotics, all dedicated to fabricating new construction dies, calibration systems, and templates. By 1994, this facility had undergone two expansions and saw the addition of a two-story office building, bringing its total floor space to 465,000 square feet. 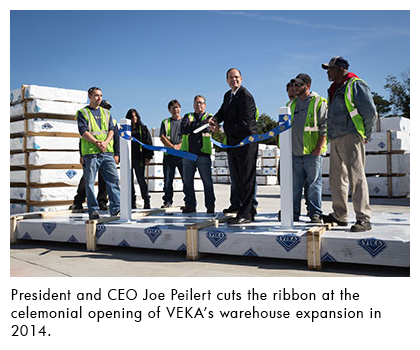 In 2000, VEKA began selling VEKAdeck® and added 118,000 square feet to the facility in Fombell. In 2014 and 2015, VEKA expanded in Fombell further with additional silos, extrusion lines, and warehouse space for our growing presence in North America.